Monday Night Music presents “21st Century Flute Music: The Exotic Versus the Melodic,” Monday, September 9 at 7:00 p.m. The concert, which features Linda Kirkpatrick, flute and Rachel Andrews, piano, will take place in McDaniel Lounge. Dr. Kirkpatrick earned her doctorate from the University of Maryland. 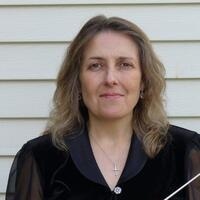 She teaches flute at McDaniel College, where she also coordinates instrumental music education, conducts the wind ensemble and student chamber ensembles, and teaches instrumental conducting and music appreciation. Rachel Andrews graduated from Towson University with a BS in Piano Performance. Mrs. Andrews has been teaching piano for 25 years and is the instrumental accompanist at McDaniel College. She also accompanies for many students in the Solo and Ensemble Festival and for many competitions and recitals throughout Maryland.